BIC visits the articular churches! The weekend of July 13-15, a group from our community did a little tour of Slovakia, visiting the articular churches in Hronsek, Kežmarok, Istebné, Lestiny and Svätý Kríž, and the Orava castle. Below you can find some pictures from the trip. The Articular Churches are stunning examples of the Slovak tradition. Forced to build places of worship under harsh articles (Articular Church), these Slovak Lutherans built masterpieces which continue to stand for resilience and love of the Gospel. the church must only use wood (so as not to have longevity)---this includes nails! The altars are painted to look like marble, but in fact everything, even the chandeliers are made of wood and there are not any nails! no more than two churches per specified region. This book was made by Intern Pastor Emily Stelling February 2018. It was given for personal study to the Fourth-Year scholars at The Evangelical Lyceum, and is available after Sunday services and in digital format in this post. Lent is a 40-day season in the church’s liturgical calendar that leads up to Holy Week—a week that follows Jesus Christ into the city of Jerusalem on Palm Sunday; observes him washing the disciple’s feet and instituting the new covenant in his Last Supper (this is known as Maundy Thursday); worships Christ as he is tortured, crucified and buried on Good Friday; and witnesses the Son of God rising victorious on the Third Day launching an even longer period of 50 days to celebrate Easter! Starting with the solemn service on Ash Wednesday, we privately, and yet publically in the company of the saints, repent. Repentance is a change of heart. It is about reflecting on your relationship with God and recognizing your desperate need of God’s grace and mercy. But it is not all doom and gloom for repentance is a joyful response to the grace of God! We continue to come together more often than usual (Sundays and Wednesdays, formally) to worship, pray, study, and meditate on those things that distance ourselves from God. There are many Lenten devotionals available online or in book stores but this particular Lenten devotional is designed to give a general mediation as well as gentle guidance over the course of each week in Lent as compared to every day in Lent. Having a daily subscription to something may seem daunting and unrealistic. Hopefully, this will give you more grace to reflect over the course of a week or perhaps just one hour that week. Your devotion to God is yours and yours alone. So, make use of this devotional how you will! But the hope is that something in these pages will spur you to see and assess your relationship with God. The booklet is available for download here. Intern Pastor Emily Steling created this prayer book in November 2017, to be an aide to guide your prayers during the worship services of the Advent season. Advent is the first season of the church calendar year. It is (typically) four Sundays leading up to the birth of Jesus Christ the Messiah (AKA Christmas). Each Sunday there is a different theme, symbolized by the candles on the Advent wreath. The themes are: Hope, Peace, Joy, and Love. Since it is getting darker sooner, Christians around the world proclaim that Christ, as the light of the world, will come soon to crush the darkness and be a light to all the nations! Advent is a time to prepare ourselves (mind, body, spirit) for the birth of the promised Savior. The book is available for download here. Feel free to use it as well for your personal devotions at home. It was great to see so many BIC-ers at the Fall Retreat this weekend. We were blessed with good weather, despite a storm being forecast, and are now back in Bratislava, smelling of wood-smoke and feeling relaxed, challenged and reinvigorated. Thanks to Pastor Derek for leading the Saturday programme and Intern Pastor Sharayah for leading our Communion Service on Sunday. Keynotes were learning to see with the eyes of our hearts, and remembering to take the log out of our own eye before trying to remove a speck from someone else's. We also learned, through many conversations and activities such as the St George Quiz and treasure hunt, Anna's craft project, the campfire, eating together, worshipping and wine tasting, more about how we fit together as a faith community, supporting one another and reaching out to those outside. See the pictures below for a taste of our weekend. Last gathering before the summer break! BIC students and young adults meet for lunch, prayer, encouragement and sharing on the first Sunday of each month. Sunday 3rd July at Philip and Rachel's apartment in Old Town. Today we prayed for each other as we went our separate ways - some back to their home countries, others on to new adventures. Several BIC members gained a unique insight into our host country with Katerina, who is a Registered Guide in Slovakia. Long drive to the North, but so beautiful! We visited Čičmany, a gingerbread village in Žilina, Northern Slovakia. The Nativity scene in this mechanical wooden model is surrounded by images of Slovak life. A must see! The most visited attraction of Slovakia! Our Listening Season has energized us to come together around our common interests and minister in new ways. This week (after coffee) we had our first walking tour of Bratislava. Jared King lead us through old town and taught us about some of the history of Bratislava. The coolest part of this ministry was that we had new visitors with us. That's exactly the kind of hospitality that our congregation is good at: making visitors feel like part of the community. In reality, visitors become part of the community their first time with us. So, we were able to strengthen existing connections and make new ones as well as learn a little bit about Bratislava and get some sun in the process. We heard Acts 2 in over 10 languages and were reminded of the Spirit through the Pentecost-decorated space and children as they ran through with streamers. It was an especially moving Pentecost worship service. Playing catch with the congregation, Pr Dominique illustrates that when we expect we might be part of what's going on around us, we're more alert. Being in the international setting, Pentecost means a lot to us. We all come from different backgrounds and we all speak different languages. On Pentecost were reminded that the Spirit is moving between us. Pastor Dominique reminded us that we should expect that we will be part of what the Spirit is doing in the world and she encouraged us that we will then notice ways that it is working. When you see God working in the world, tell others about it. Be bold, like Peter and speak about the truth you think you're seeing — it invites others to experience and notice God working in the world through each of us! We are a sending church. This week Richard and Gloria Lokken returned to the United States after visiting Bratislava and Central Europe for 11 weeks. We also prayed for Pr Dominique as she returned to California temporarily for Graduation. We are so blessed to have people come in and out of our congregation as they travel through Europe or spend years teaching or working here in Bratislava. Blessings! We are so proud of our confirmands. We celebrated as a community today as 4 of our youth affirmed their baptisms and confirmed their faith! BIC worked alongside other volunteers in feeding the Syrian migrants as they crossed from Hungary to Austria. This was a profound experience that will never be forgotten. The Hungarian border soon closed, so BIC is now traveling monthly to Vienna to join in a “Let’s Play” NGO, playing and interacting with the migrants who are working to settle in Austria. After many years of holding Sunday school in the sacristy, BIC was given the “green light” to transform the storage room into a Sunday school space! While a little more work needs to be done on the walls and floor, we are excited about the transformation! YAGMs lending their voices to the choir. BIC hosted a retreat for the YAGM of Eastern Europe. Pastors Gail & Randy hosted the group in their apartment and presented a session on The Five Love Languages. Pastor Dominique walked the YAGM volunteers through a day of listening for God. Coffee Hour is a big deal at BIC! Following worship, people head next door to The Next Apache, a coffee shop that has opened its doors to us. Sharing a cup of free coffee or tea, people from many cultures, places and traditions have a safe place to relax, visit, and get to know one another. Bratislava International Church began 22 years ago, soon after the re-opening of the Lutheran High School in Bratislava (Evanjelické Lýceum which began in 1606). In 1991, The Lutheran Church of Slovakia contacted the ELCA and asked for English speaking teacher volunteers to come and work at the newly re-opened Lutheran High school. Volunteers did come and began working at the high school. Worship was held at the school in English for those who spoke English. And then there seemed to be a greater need, beyond offering worship services for just the teaching staff, for those whose first or second or third language was English. Answering the calling of the Holy Spirit, and the need for a English worship service, the Evangelical Lutheran Church in America, helped to start BIC, an international, inter-denominational, inter-cultural church; which began as a worship service and has grown over the years into a ministry. Some of our confirmation class making “Holy Week bracelets” to hand out to the congregation on Palm Sunday. They were to be worn to help remind us of the gravity of the week. The Confirmation service is coming up on May 8th. Receiving “diplomas” stating that the teachers now know how to prepare Slovak soup and may do so in their home country. It's a blessing to work alongside such welcoming Slovak colleagues. The pastor’s apartment is used frequently for Bible study, midweek soup suppers and worship, young adults’ monthly gatherings, confirmation, and council meetings. They also host a young adults' gathering monthly. More and more people join us each time, searching for community while living abroad. Thank you for all you do for our community of faith at BIC. What interests you? Comment below and tell us what else you'd like to know about our ministry. Bratislava is beautiful to visit. If you know anyone traveling in our area, we'd love to welcome them. The Lutheran School is always looking for great teachers—we'd love to talk with anyone interested in the teaching program in Central Europe. When else are you going to have an opportunity to live a year abroad and have a legitimate job too? This is not just basic English; you’ll be teaching students working towards fluency. You’ll learn the local customs and traditions first hand from your students and colleagues. And on vacations you’ll have time to travel Central Europe and beyond. BIC has joined a group called Let's Play (they are on Facebook)! They are a group of volunteers doing wonderful work at two refugee camp locations in Austria: Hietzing-Pavilion 12 and the Ferry Dusika Stadion-Notunterkunft. The Let's Play group goes to refugee camps and provides games, face painting, and fun for the kids living there temporarily. Sign up to volunteer at the camps! Our first trip will be Saturday February 20th, and then the 3rd Sunday of every month unless there are changes that are out of our control). Details to be announced each month). The activities include spending time with the families and children, reading, painting, playing games, doing puzzles, and language practice (German primarily, and English). The third Sunday of each month from 2:30-5:30 at the camp (leaving Bratislava by car, bus, or train around noon and returning in the evening). If you're not able to come, you can still make a huge difference in these children's lives. They would love toys, puzzles (3-5cm pieces), art supplies, games, children's' books with very basic German or to practice language skills. You are welcome to bring your donation to BIC worship on Sundays and they will be collected and brought with on the monthly outings. We've needed a neew piano for a long time and after a long journey we've got it in the Malý Kostol sanctuary. We're blessed by everyone who donated and helped along the way. It sounds great. Here's a short clip from one of the first services we were able to use the piano. Join us for our newly-in-tune worship or join the choir. During Lent we're practicing on Fridays but usually we meet every Wednesday at 6:00pm at Malý Kostol. What a fun and rewarding weekend! YAGMs (Young Adults in Global Mission of the ELCA) from Hungary were in Bratislava for a Lenten retreat. We hosted them on Saturday for a seminar on The Five Love Languages and then again on Sunday for a soup lunch with the confirmands and a discussion on their lives as children of God. Feeling joyous from interacting with such awesome people! Read the previous blog post about BIC's Listening Season. Simply put, a One-to-One is a meeting between two people who are interested in getting to know one another. Half of the conversation is spent asking questions and listening to the other person, then the focus shifts and you share about your story. because it has an objective that is bigger than ourselves and requires active listening. A date or an expectation that a friendship will result. Friendships may develop naturally, but the initial conversation is two brothers and sisters in Christ that are interested in strengthening BIC’s identity and clarity about where God is calling us. This is a PDF of the conversation starters that are (also) included below. Use this sheet after a One-to-One to write down the main ideas that came out of the conversation. These conversations are an opportunity to get to know each other beyond surface level conversation, to slow down and listen actively to one another’s stories. How did you end up at BIC? What keeps drawing you back to this community? Have you always been a part of a church community? What was it like to grow up where you are from? What breaks your heart when you see it out in the world? In your home? At BIC? What is most of your time spent doing? Does it drain you, or feed/motivate you? How did you end up doing the work that you currently do? What other jobs and hobbies have you had? What is the most frequent stressor in your life right now? How does that influence you? Where/when do you laugh the most? What activities, people, or places allow you to feel free and relaxed? Where do you hear and feel God? What feeds your faith? Where do you feel or see yourself called by God? Stories share much more than specific answers to questions, so start here, have fun, and let the conversation go where it leads. Ask for clarification in questions like Why? How? What was that like?, etc. Our community is made up of wonderful, diverse, interesting, warm, loving people. This is hopefully an opportunity to enrich BIC and our individual lives. What is a “Listening Season”? God together in worship, Bible study, and prayer, as well as in our individual lives of faith. The broader community which we will decide when and how we want to do at the conclusion of our listening to one another, first strengthening the bonds within BIC. Read more about One-to-One Conversations and how to participate. What is the purpose or goal of our Listening Season? Who are we? Who makes up this community that God has drawn together from all over the world? How/where is God calling us? What are our hopes and dreams for our church, our families, our community? What are God’s? And only God knows what other possibilities! What will we do with what we learn? We will prayerfully brainstorm how we would like to act on the information that we have learned about who we are and where God is calling us. Tonight is a night to remember because heaven meets earth. God is coming into the world as the Christ child. God is entering our messy, stressful world because of his abiding love for us. And we remember that this love story comes to us in the midst of a dark, depressing world. It was dark at Jesus’s birth and it’s dark today. But this is when God comes into the world. If you truly love someone, it doesn’t matter what the circumstances are. And God truly loves us. May you feel God’s love for you and may Christ’s light shine through you. Merry Christmas to you from Bratislava International Church. Take a look, and share the updated site on your social media! Max Buchholz (Distilled Studio) designed the website; its goal is to be a clear and welcoming introduction to newcomers, to share our story, and to keep BIC up-to-date about upcoming events and worship. December 17: Next Apache courtyard. Worship will begin with a 15 minute outdoor devotion, followed by dinner and discussion at a nearby restaurant. We’ll celebrate Christmas Eve with a candle light worship service. Join us the Sunday following Christmas to journey through the stories of Christ’s birth and life in Scripture and through song. Remaining cost: 600 euros are needed to cover the piano, its move, and a stool. That will also be matched, and we will be ready to hear the new piano in use at the Maly Kostol. Piano offerings may go into the marked envelopes available in the back of the church. The new piano has been reserved for the Maly Kostol in the Yamaha showroom in Bratislava. Your generosity has already raised 2,050 euros! Matched by the budget, that’s 4,100 Euros. All confirmation-aged youth are welcome! We gather 2 Sundays per month an hour after worship. See Pr. Gail for more information. Continue inviting one another and enjoy your time listening! For more info, see Intern Pr. Dominique. Please sign up to share your gifts in worship either on the Give page or on the clipboard at worship. Your assistance as an usher, with Communion, reading, praying, and greeting are so much appreciated! We send out weekly announcements so you can keep up with what BIC is doing. Enter your email if you'd like to stay up to date. We gathered at the Christmas Markets for the 2nd week of Advent. In this unseasonably warm winter weather, we enjoyed meeting outside at the Christmas Markets for our second Advent Outside service. We reflected on expecting to see God in the world and how that is portrayed in Luke. Even when Zechariah WAS expecting to see God—he was in the most holy place of the temple, where they believed God lived—he was still terrified! It was a lively discussion and the Christmas Market was a great place for it. We had a chance to look around and let it sink in that God is in everyone. Everyone we meet. How surprising would it be if we actually looked with God's eyes and did see God in everyone? The Bratislava International Church owes its origins to the re-opening of the Evangelical Lyceum (Lutheran High School). That school, whose history goes back to 1606, was closed during the communist era and re-opened in September of 1991 as a bilingual Slovak-English institution. The Lutheran Church in Slovakia asked the Lutheran Churches in the United States to provide volunteer English teachers to help with this new start. At first informal worship services were held at the school primarily for the teachers and interested students. In 1994 Pastors Twila Schock and William Swanson and Associate in Ministry Lynnae Sorensen were called to further develop the religion department and to establish a regular worshiping congregation. There was an early desire to expand the concept of the congregation to include not just American teachers, but the larger English-language expatriate community in Bratislava. The Slovak Lutheran congregation in Bratislava offered the use of the historic Malý Kostol (Little Church) as a regular worship space. This Baroque style building was constructed in 1777 and is a truly international setting. Every Sunday morning, in addition to the English language worship, there is a German service, and a Hungarian service. At the same time a Slovak service is taking place at the Veľký Kostol (“Big Church") next door. Slovak, German, and Hungarian reflect the tri-lingual history of the city going back hundreds of years. Pastors Schock and Swanson served the newly developed English congregation until 1997, at which time they were called to serve the International Protestant Chaplaincy in Moscow. That same year Pastor Paul K. Hanson was called to the position of pastor of the congregation, and served Bratislava International Church until his retirement in 2004. During Pastor Hanson’s tenure Pastor Ann Sorum was called to serve the congregation as Associate Pastor. She served until July of 2006, when she returned to the United States. Pastor David Schick served the congregation from October 2004 to July 2009. Pastor Schick also continued the tradition of pastors in this congregation’s past by working simultaneously as a professor of religion at the Evangelical Lýceum. One more change in pastoral leadership took place in September 2006, when Pastor Josh Auchenbach stepped into the position of Associate Pastor of the congregation. From 2009 to the beginning of 2012, Pastor Arden Haug, originally from Minnesota, served the congregation. Pastor Haug also served, and continues to serve now, as the ELCA's Regional Representative to Europe. In February 2012, Pastor Miriam Schmidt, originally from New York City, was installed as the congregation's new pastor. Pastor Schmidt came to Slovakia from western Montana, where she served as a congregational pastor in Plains. 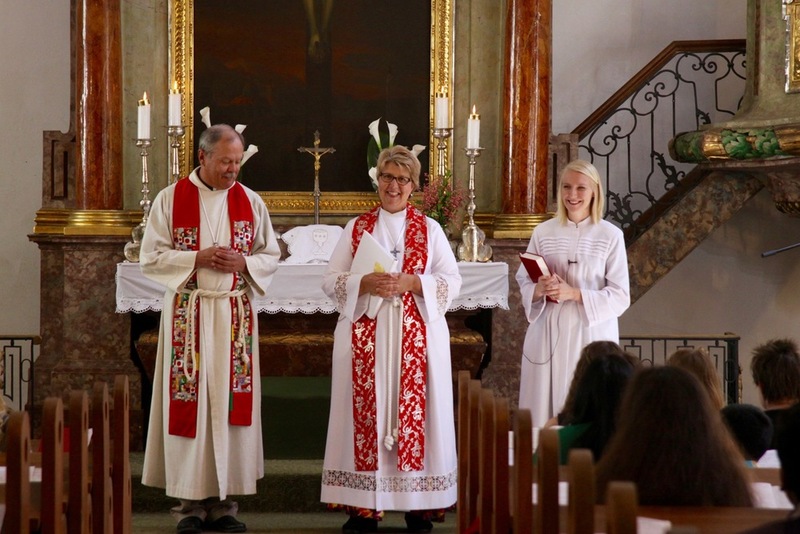 Here in Bratislava, Pastor Schmidt's additional role is to be the Coordinator of the ELCA's Young Adults in Global Mission Program in Central Europe, whose emphasis is ministry to the Roma communities living in Hungary and Slovakia. In October of 2015, Pastors Randy and Gail Mundt, from Colorado, were installed at BIC. They work at the Evangelical Lýceum as pastors in the past have also done. They have a love for international ministry and as recently as 6 years ago they served an international congregation in Vienna. 2015 brings new questions about what it means to live internationally while there is a refugee crisis. We continue to grow and evolve as a congregation and our story is just beginning.